The Wyoming Statewide water plans, individual basin plans, and all other planning studies produce various geographic infiormation contained in a Geographic Information System (GIS). This data is important for planning purposes, as well as providing base datasets for future planning projects. Access geodata templates, standards for metadata, base data, and information for submitting GIS data from reports. Access Individual Basin Plan data by clicking on the desired location below. 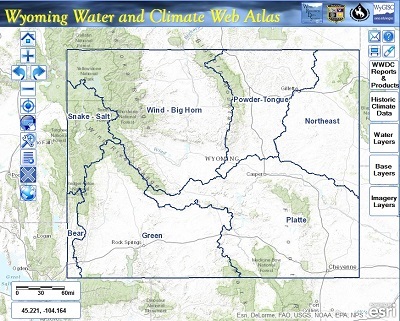 Use the Wyoming Water and Climate Web Atlas to access GIS Data derived from individual project reports.